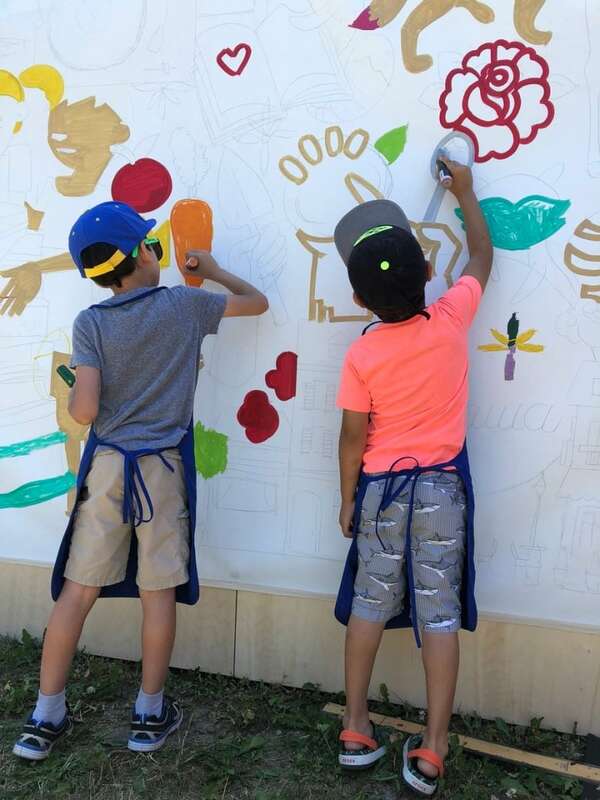 With more than two metres of canvas, a handful of paint markers, five hours and hundreds of little artistic helpers, CBC Ottawa partnered with the Ottawa Public Library to create a beautiful community mural at the Tales and Tunes Family Fun Day on Saturday, July 7. 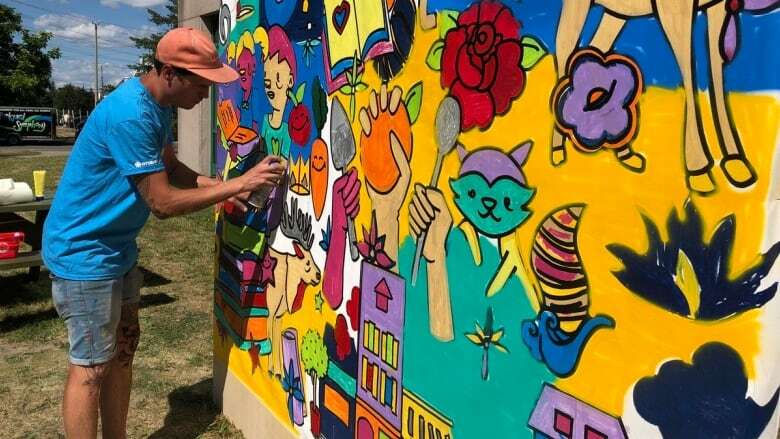 Artist Robbie Lariviere puts the finishing touches on the CBC Ottawa community mural as part of the Ottawa Public Library’s Tales and Tunes Family Fun Day on Saturday, July 7. With more than two metres of canvas, a handful of paint markers, five hours and dozens of little artistic helpers, CBC Ottawa partnered with the Ottawa Public Library to create a beautiful community mural at the Tales and Tunes Family Fun Day held at Ben Franklin Place on Saturday, July 7. The story behind the mural, designed by graffiti artist Robbie Lariviere, brings together all things Ottawa. In bursts of bright colour, it shows lots of library books, friendly local animals, fruits and veggies and more! Lariviere described it as a "big, fun colouring book." The theme for the library event was Stone Soup, a traditional folktale that highlights the benefits of collaboration, creativity and community. Kids make their mark on CBC Ottawa's community mural at the Tales and Tunes Family Fun Day on July 7. "This really helps us tie in this theme of stone soup, where everyone is contributing to one thing and we'll have this great piece at the end," said Alison Blackburn, manager of program development at the Ottawa Public Library, in a CBC Ottawa Facebook Live at the event. It didn't matter if you were age 4 or 44, everyone was invited to pick up a paint marker and help contribute to the mural. Once the canvas was covered in wall-to-wall colour, Lariviere put on the finishing touches with some spray paint, adding his own graffiti style. Now that the mural is complete, CBC Ottawa is working with the Ottawa Public Library to share this project with its 33 branches across the city. Keep an eye out for this colourful collaboration in your local library this fall. The Tales and Tunes Family Fun Day also included crafts, workshops, gardening, an escape room and live music on the main stage from beloved family entertainer Fred Penner, eco-friendly percussion group Junkyard Symphony, spoken-word artist King Kimbit and many more. Keep an eye out for CBC Ottawa's community mural, designed by artist Robbie Lariviere, in your local library this fall.